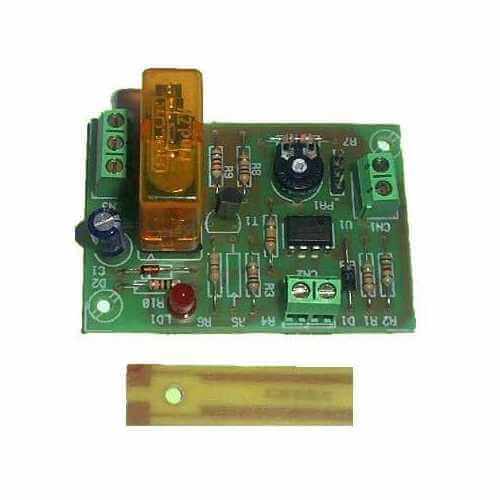 Uses a sensor (included) to detect the presence of a liquid and turn on the relay. Relay turns off when liquid is no longer detected. Ideal for controlling pumps, etc. Detection sensitivity is user adjustable for different types and heights of liquid on the sensor. The board may also be set up to switch off when the sensor comes into contact with the liquid. Module features reverse polarity protection, LED relay active indicator and screw terminal blocks for connections. Output relay rated to switch 240Vac or 28Vdc @ 5 Amps Max. Ideal for controlling liquid levels in tanks, wells, ponds, etc.